There aren't many things in your rig that are more important than the power supply (PSU). You want something that has enough juice to power your latest and greatest, the reliability to get you through the game, and something you might not have thought about, a "green" construction. 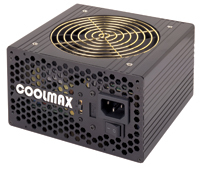 If you are looking for power, reliability and/or wish to be a Planeteer, then the CoolMax RM-750 Aluminum Power Supply might be just for you. "With dual PCI-E connectors, the RM-750 carries all its essentials to power your system. Enjoy the graphic rendered programs and games without the threat of overheating. Its dark aluminum chassis not only looks good, but dramatically relieves heat built-up. The 120mm fan enhances the already efficient heat dissipation rate and helps balance the cooling system with noise level. The RM-750 is great for high end users to everyday casual users. Whatever your system needs, the RM-750 can deliver."